Many of France’s nuclear units are down for inspection. As a result, coal and natural gas generation has more than doubled. 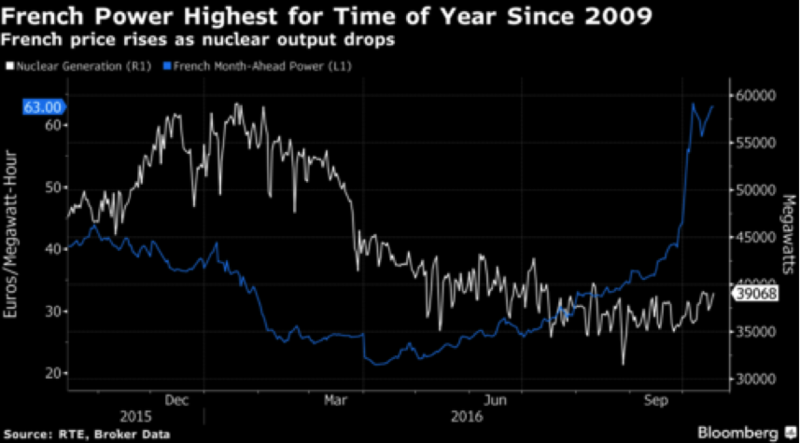 Last month, generation from fossil fuels was the highest in 32 years in France and nuclear generation was the lowest since 1998. As a result, French month-ahead power prices escalated to near the highest levels since 2009. Germany is replacing its nuclear units with renewable energy (wind and solar) as part of its energy transition, the so-called Energiewende. It is using mainly coal to back-up its intermittent renewable energy and as a result, it has increased its coal-fired generation. Due to the higher cost of wind and solar units, residential electricity prices have escalated and are 3 times that of the United States. Note: Other renewables are geothermal, biomass, and other. France has seven fewer reactors available than at the same time last year. France’s nuclear regulator ordered safety checks on 18 of its 58 units to rule out potential anomalies on steam generators. Six reactors, however, are expected to be back on-line this month. France is also faced with the lowest hydropower output in 10 years, which is exacerbating the tight supply situation. Hydropower levels are down 25 percent so far this October compared to last year. The change in generation has caused prices to spike. The French next-month contract is trading at a premium of 24.90 euros ($27.42) per megawatt-hour to Germany. The price rose to a seven-year high of 68.15 euros ($74.82) per megawatt-hour on October 7. Day-ahead electricity jumped as much as 18 percent to 77 euros ($84.54) per megawatt-hour–the highest since April 2013. Germany’s coal-fired generation last year declined by just a half percent and because its electricity demand remained essentially flat, the relatively inexpensive coal-fired power not needed domestically was exported–mostly to Austria, the Netherlands, France and Switzerland. [viii] Germany’s plan to reduce carbon dioxide emissions includes renewables replacing coal as well as its nuclear power, but its coal-fired generating industry refuses to go away. 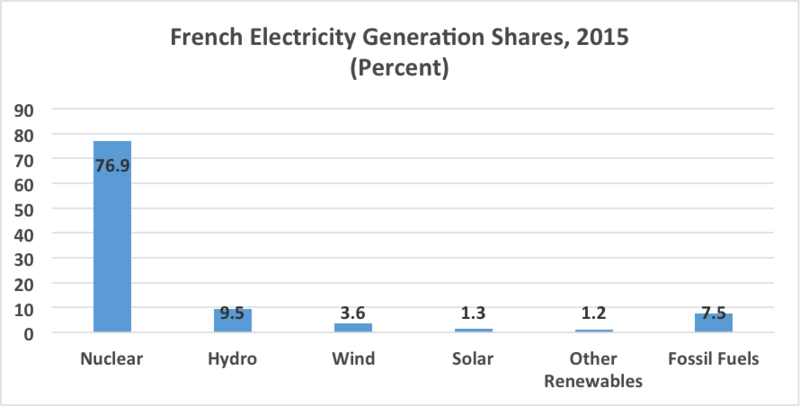 Coal is not going away in France and Germany as both countries need it to keep the lights on when nuclear units in France are down for inspection and as Germany’s energy transition brings in intermittent renewable energy to replace its retiring nuclear units. 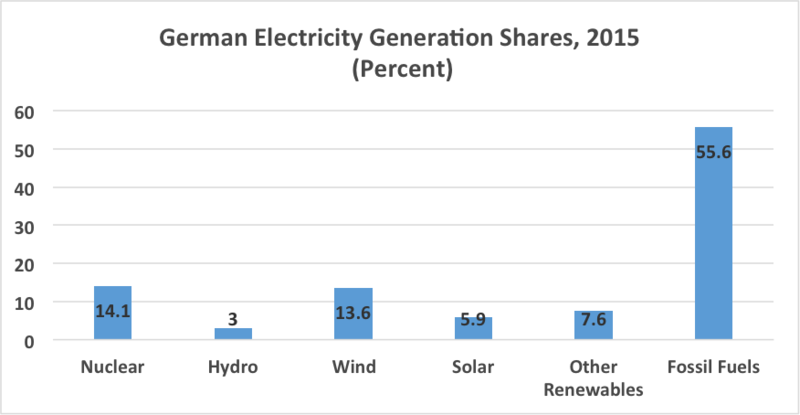 Coal, particularly lignite coal, is indigenous to Germany and supplies the majority of its power despite the dramatic growth in Germany’s wind and solar power industry. [iv] In July 2015, Germany announced that it would mothball 2.7 gigawatts of the oldest lignite-fired capacity to meet its 2020 climate goals.